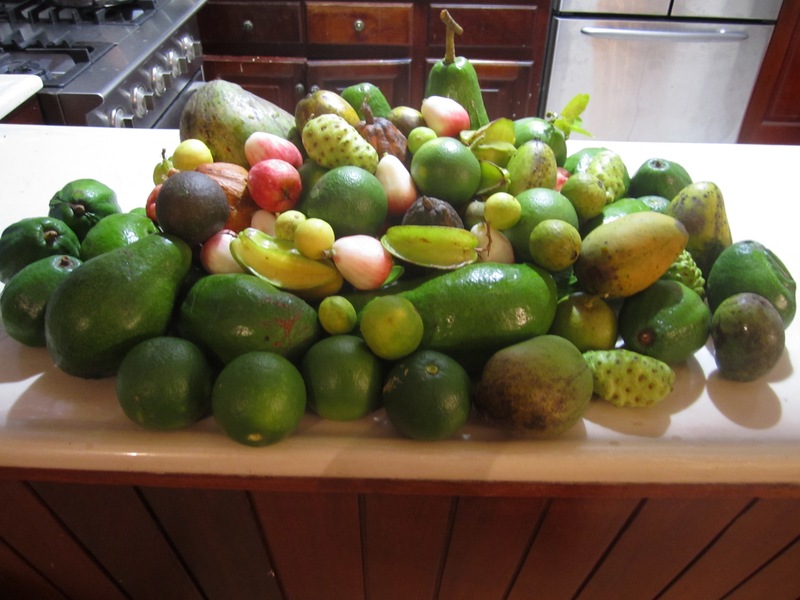 Spending a week in DR traveling to and fro, one thing becomes clear- fruit, fruit, fruit…is everywhere. No matter where you are it seems if a bounty of fruit is just an arms reach (or a tree climb) away. While continuing our search for housing, we visited a home for rent that sat on a large piece of land with many fruit trees. As we toured the house I was laughing as Renzo’s mom Taty started picking fruit off their trees, gathering goodies to take home. It seemed as though everywhere we went (family & friend’s houses, etc) Taty would make sure to grab some fruit off the trees before we left. When we went to visit Renzo’s cousins, it was the same story. Head to the backyard and see what you can find. He and his cousin Robert started throwing rocks and bottles up into the trees to try and knock some fruit down. 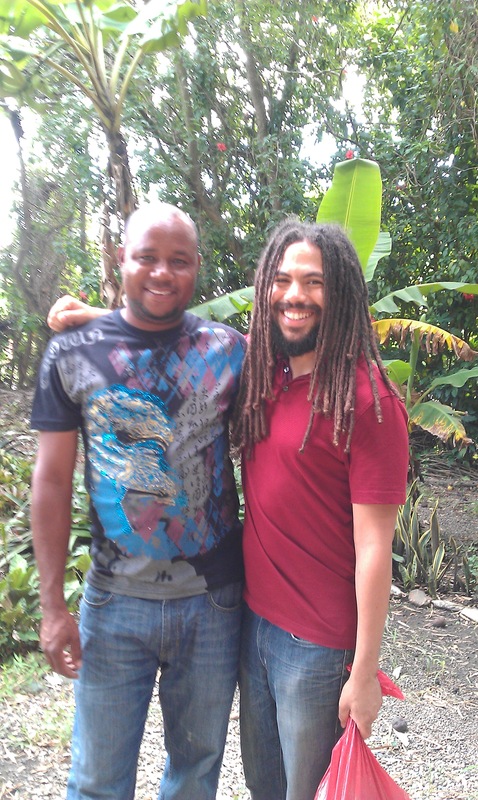 Here is a picture of Renzo & cousin Robert. Notice the red bag in Renzo’s hand. Lol, can you guess what it is filled with? We got a bunch of mangoes there, but no avocados yet. Seeing how keen Taty was to get some avocados, her cousin Robert told us he knew “just where to go”. Turns out “just where to go” was his co-worker’s house so since we were all in the car already we just stopped by. His co-worker wasn’t home but his wife and children were, so Robert drove around a bit until we found him hanging out at a friend’s house. Robert told him we were looking to get some avocados. 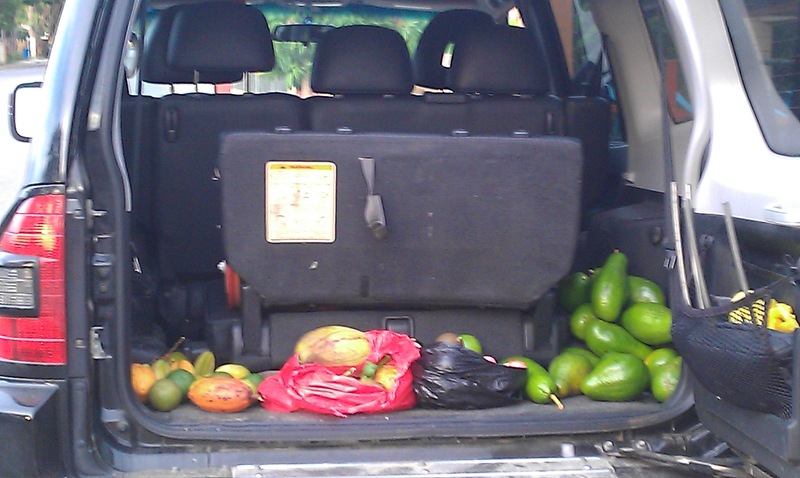 Of course this was no problem at all, so his friend jumped in the car with us and took us to his home, where he loaded us up with enough avocados from his yard to feed an army (apparently he had 17 different types of avocados growing on his land!). 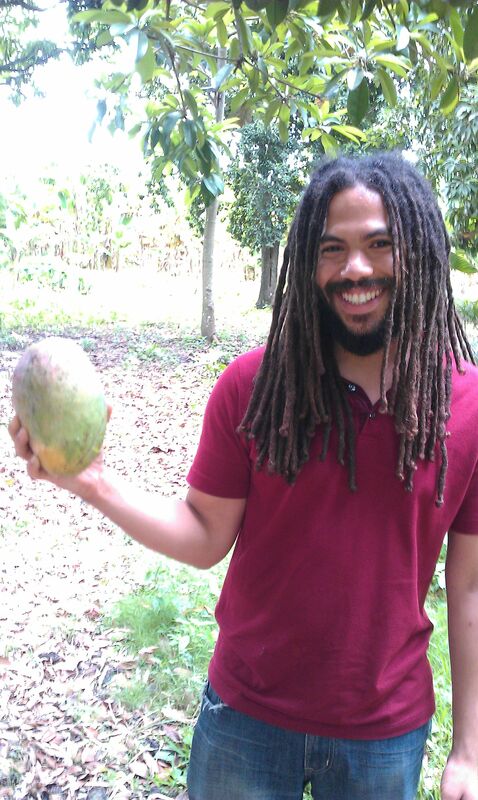 At one point we even came across a young boy walking on the side of the road with a large basket of fruit, with one gigantic soursop fruit sitting on top. Taty told her cousin Robert to pull over to inquire about buying it. When we pulled over, Taty asked the boy how much he wanted for the soursop. “Gratis” he said. Turns out his grandmother had given it to him from her yard, and here he was gifting it to a perfect stranger simply out of the kindness of his own heart! Amazing! I asked Renzo if this gathering/giving of fruit is typical in DR, or if I was just witnessing Taty doing her thing. According to him and his mom, apparently it is considered perfectly acceptable to pick some fruit for yourself wherever you are. Wow! I was really blown away by the spirit of all these people sharing mother nature’s bounty. I will leave you with a photo of Taty’s kitchen counter. It was too unbelievable not to take a picture. All of this fruit was gathered in the one week we were there, and all of it was “gratis”. Amen sister. Humanity-WE in action. Now time for the juices and guac! Quality goods here on dominicanroots.com, man. gather a lot from you. A useful blog without a doubt.